Piqua’s Kamy Trissell passes the ball against Troy. 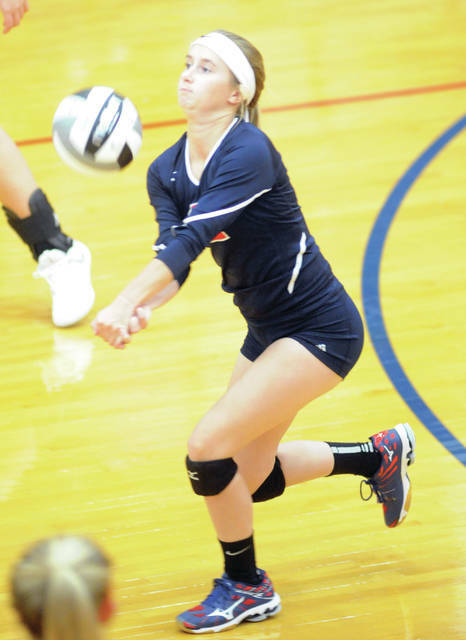 Piqua’s Reagan Toopes receives serve against Troy. Piqua Tylah Yeomans hits the ball as Haleigh Beougher looks on. Piqua setter Audrey Poling bumps the ball to a teammate against Troy. 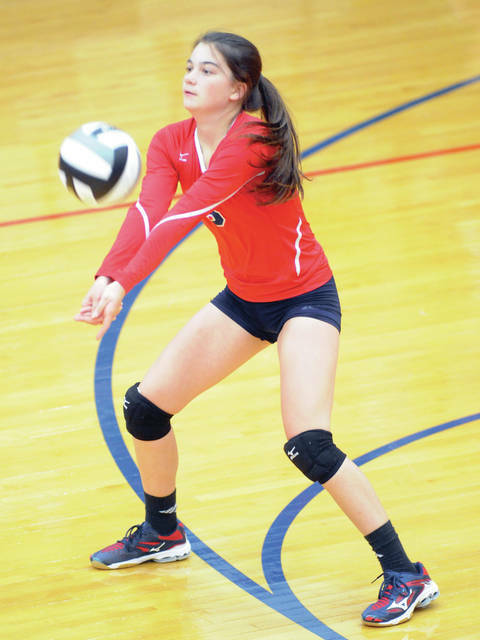 The Piqua volleyball team will look to pick up its first win Thursday at Trotwood-Madison. 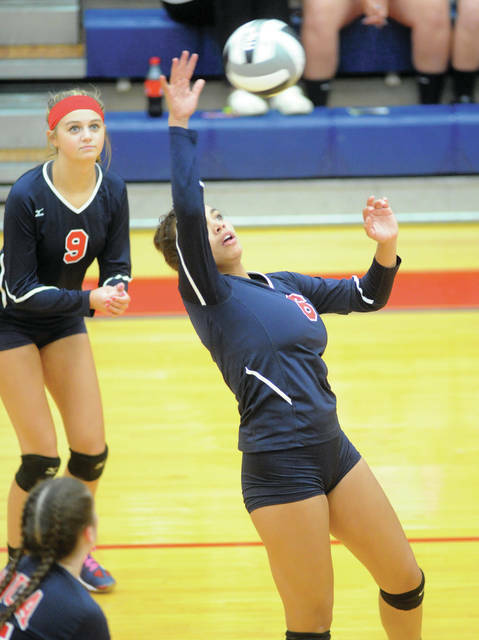 Piqua lost to Troy 25-13, 25-15, 25-20 Tuesday. Tylah Yeomans led the Indians with eight kills, seven digs and six assists. Aubree Schrubb had three kills and Danielle Widney had two aces. Audrey Poling dished out five assists. Reagan Toopes led the defense with eight digs and Kylie Trissell added seven. 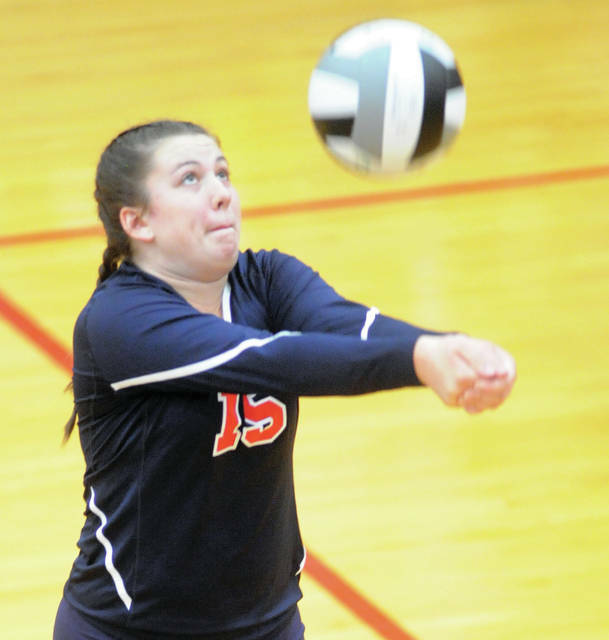 NEW MADISON — Miami East improved to 4-3 and 3-0 in the Cross County Conference Tuesday night, defeating Tri-Village on the road 25-20, 26-24, 25-18. Nichole hood led the Vikings with 16 kills, an assist and 19 digs, Sophie Jacomet had 10 kills and 32 digs, Ashlyn Monnin had 10 kills, an assist and a dig, Lydia Conley had seven kills, three blocks and a dig and Delaney Bourelle had a kill and a dig. Macie Schaffner had 30 assists, a kill, an ace and eight digs, Gabrielle Hawkins had a whopping 53 digs, four assists and an ace, Gretchen Frock had three assists and two digs and Lauren Fisher had 11 digs. ANSONIA — The Covington volleyball team picked up its first win of the season, outlasting Ansonia 19-25, 25-22, 22-25, 28-26, 15-9. Makenna Gostomsky had six kills and 8 digs, while Ellery Reck had 19 assists, two aces and five digs. Makenzee Maschino had one ace and 12 digs, while Maci White had five aces and eight digs. Alyssa Kimmel had two aces, four kills and 12 digs, while Lilli Hamilton had 11 kills, two solo blocks and two assist blocks. Tori Quinter had six aces and seven digs, while Marisa Fields had three kills and one solo block. Olivia Mohler added five kills and one solo block. PLEASANT HILL — The Newton volleyball team split two matches. The Lady Indians defeated Tri-County North 24-26, 25-14, 25-8, 25-13 and lost to National Trail 18-25, 25-19, 25-19, 18-25, 15-6. ANNA — The Houston volleyball team lost an SCAL match to Anna Tuesday 25-13, 25-19 and 25-14. Catryn Mohler led Houston with six kills while Hayden Riesenbeck had three. Alyssa Kemp had 15 assists and five digs, Alex Freytag had three aces and Olivia Bowser had 13 digs. The Covington junior high volleyball teams swept Ansonia. The seventh grade, 4-1 overall and 3-0 in the CCC, won 25-22, 25-21. The eighth grade, 3-2 overall and 3-0 in the CCC, won 26-28, 25-23, 25-21. They play at Tri-Village Thursday. The Bradford junior high volleyball teams lost to Arcanum. The seventh grade lost 25-3, 25-9. Savannah Lingo and Tegan Canan each scored for the Lady Roaders. The eighth grade lost 25-14, 25-11. Lovena Grillot had four points, Courtney Riffell had two points and one ace, Remi Harleman recorded two aces, and Tasya Felver and Shay Swick each scored one point. Bradford hosts Twin Valley South Thursday. The Covington boys golf team lost to Tri-County North 171-193 in CCC action. Dylan Lucas led Covington with 44. Other Covington scores were Jack Shell 47, Hunter Alexander 50, Grant Humphries 52, Thomas Kuether 62 and Job Morgan 66. GREENVILLE — The Newton boys golf team defeated Ansonia 175-218 at White Springs in CCC action. Chet Jamison was medalist and led Newton with 35. Other Newton scores were Garrett Peters 44, Nate Zielinski 46, Ross Ferrell 50, Britton Schauer 50 and Ryan Mollette 54. ST. PARIS — The Miami East Vikings picked up a Cross County Conference win Tuesday at home, defeating Twin Valley South 183-198 at Lakeland. Sam Zapadka was medalist for East with a 42, Keegan Mahaney and Andy Bevan both shot 45 and Cooper Elleman shot 51 to help the Vikings improve their CCC record to 4-3. ARCANUM — The Bradford golf team dropped a Cross County Conference matchup to Tri-Village Tuesday at Beechwood Golf Course, falling 185-211. Keaton Mead led the Railroaders with a 46, Taven Leach shot 49 and Eric Sanders shot 51. BOTKINS — The Lehman Catholic boys soccer team lost 7-0 to Botkins Tuesday. SIDNEY — The Lehman Catholic girls soccer team blanked Botkins 9-0 Tuesday. Lehman improved to 3-0 overall and 2-0 in the WOSL. Ava Behr and Samantha Edwards had two goals each, while Lindsey Magoteaux, Olivia Monnin, Lyndsey Jones, Maegan Titterington and Liz Gibson each scored one. Grace Olding, Rylie McIver and Ella Monnin had two assists each, while Behr, Samantha Edwards and Allison Bornhorst had one each. Hannah Giguere and Hiedi Toner combined on the shutout in goal. Saturday’s JV game with Coldwater has been moved back to a 1 p.m. start. LIMA — The Lehman Catholic girls tennis team lost to Lima Catholic Central 5-0 Tuesday. In singles, Claire Larger lost 6-0, 6-0; Sarah Gibson lost 6-1, 6-3; and Angela Brunner lost 6-3, 6-1. In doubles, Ann Pannapara and Keira Burns lost 6-1, 6-2; and Shannon Staley and Brieanna Werling lost 7-5, 2-6, 10-6 . Ann Deafenbaugh and Rebecca Sanogo won a JV doubles match 6-4.